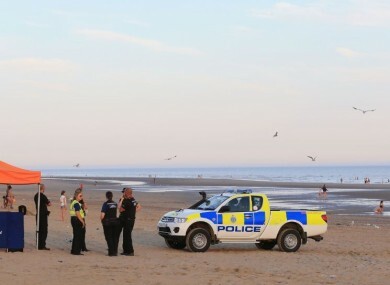 FIVE MEN HAVE died after being pulled from the water at Camber Sands in Kent near Rye, East Sussex. A sixth person is thought to be missing after the tragedy. All five men, despite efforts to save them, died at the scene yesterday. Sussex Police believe the men were all in their late teens and early 20s and came from the Greater London area. They had gone to the beach together on what was the hottest day of the year in England so far. Chief Superintendent Di Roskilly said: “These men were not fully-clothed when they were pulled from the sea but wearing clothes appropriate for being at the beach for the day. This has been an incredibly tragic incident and we are offering their next of kin support at this difficult time and our thoughts are with them. Emergency services were called to the beach at 2.10pm yesterday to reports of a person in the sea. While they were at the scene, another person was seen in difficulty at 2.20pm and 15 minutes later a third person was rescued. The bodies of a further two men were found in the water between 8.15pm and 8.45pm. Email “Five young men die in seaside tragedy in England ”. Feedback on “Five young men die in seaside tragedy in England ”.